This week, Guy Branum and Margaret Wappler are joined by Bay Area comedian and two-time Emmy winning writer Kevin Avery. He was head writer on Totally Biased w/ Kamau Bell, staff writer on Last Week Tonight w/ John Oliver and writer on The Jim Jeffries Show. The gang is deep diving into Boots Riley's new movie Sorry to Bother You. Guy, Kevin and Margaret discover that, like Sorry to Bother You's Cassius Green, they all worked as telemarketers. Plus Guy reveals the film's best actor and Kevin tells us about the time he asked Boots for help on a short film. Margaret is all about Bhad Bhabie- a troubled Florida teen turned rapper based off of a performance on Dr. Phil where she was a guest with her mom. There's this really smart analysis of the Bhad Bhabie phenomenon in the NY Times by Jamie Lauren Keiles who breaks down what she means for the entertainment industry. Kevin is all about not being about Drake's latest song and the dance challenge it spawned that's sweeping the nation: In My Feelings. The challenge even got Will Smith dancing on a bridge. Guy is all about the hard-working, talented, and badass Korean-Canadian actress Sandra Oh, who has had to work twice as hard to get half as far in entertainment. She's finally getting her due as the first woman of Asian descent to be nominated for an Emmy in the category of lead actress for Killing Eve. With Guy Branum, Margaret Wappler, and Kevin Avery. Margaret - The Coup - 5 Million Ways to Kill a C.E.O. Kevin- Justin Timberlake - Higher Higher. Guy - Years & Years - All For You. We're going guest-less this episode as the 'Who Shot Ya?' trio hold down the fort on their own. This week we're covering the movie of the summer, Sorry to Bother You. In the discussion of the film the crew covers the rise of Oakland in cinema, Boots Riley's unique vision, and the powerful political message of the film. Alonso makes a case for a double feature with Sorry to Bother You and The First Purge. Plus, the crew puts together the ultimate Top Five list of directorial debuts. And as always, staff picks. In news, Thanos apparently killed half of the animals, the cast and crew walk off the 'Roe v. Wade' film, and James Gunn says a good movie can't be ruined by spoilers. 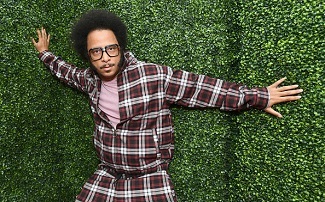 Boots Riley is the frontman and founder of the legendary hip-hop collective The Coup. The group produced simple music - the beats never had a lot of frills. When he rapped, Boots spoke plainly about stories from his real life. But it was in a really compelling, passionate way. He talked about social justice, poverty, racism and the stuff people do just to get by. A lot of hip-hop is about prosperity - overcoming a system that's been rigged against you for centuries. The Coup, however, wanted to throw the system out entirely. Boots was born Raymond Lawrence Riley. He grew up in Oakland, California. His parents were political, working actively in the NAACP and the Progressive Labor Party and Boots wanted to carry on that tradition in art. He went to film school at first, but eventually found his calling in hip-hop. Along with his friend E-Roc, he founded the hip-hop band The Coup in 1991. About six years ago, Boots started working on a movie - something he'd never really done before. He started telling his friends about it, asking acquaintances in the industry for advice - sometimes he'd just corner a producer for 15 minutes. Thanks to a combination of audacity, determination, and luck, the finished product is hitting theaters next month. 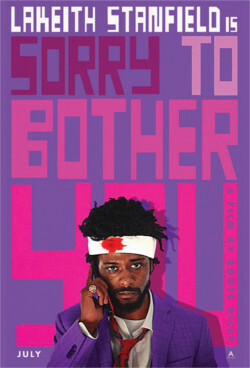 The movie is called "Sorry to Bother You." It's set in Oakland, in kind of an alternate reality. Lakeith Stanfield stars in it. He plays Cassius Green, a black man who gets a gig doing telemarketing. It's in that job he finds the key to success: do a dead-on impression of a white dude and magically, people listen when you call. From there, it gets weirder. There's elements of science fiction, horror, and more and it's out in theaters July 6. Boots tells Jesse about the recent passing of former Coup member and DJ Pam the Funkstress, The Coup's origin story, and why he doesn't think art alone can start a revolution. Click here to listen to Boots Riley's interview on YouTube. 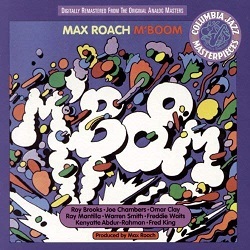 Photo Courtesy of Legacy/Columbia/ Sony Music Entertainment Inc.
Jazz drummer Max Roach founded the percussion ensemble "M'Boom" in 1970. He wanted to explore the possibilities of percussion, but it was also a socio-political statement. Roach saw the drum set as the quintessential American instrument, borrowing hand drums from Africa and the native people of North America, snares and bass drums from Europe, and cymbals from the middle east. M'Boom embraced an international spirit - and particularly the African diaspora spirit. As an African American, Roach was aware of the way his people had been disconnected from their historical-cultural context by slavery. M'Boom was an act of reconnection. Click here to listen to Jesse's Outshot on M'Boom on YouTube.